Welcome to the Winter 2016 edition of the Resiliency Reader eNewsletter brought to you by the Al Siebert Resiliency Center. We hope you will find the information and articles below useful in your quest to become more resilient. Please join in the conversation either at our online forum, or by submitting your article, review, upcoming event or other resiliency-related resources to us for possible publication. We welcome your submissions! One of the most powerful steps toward developing your personal resiliency is to choose to not be a victim. Our featured guest author this issue, Habibo Haji, shares part of her life story that hinged upon her decision to make that choice. 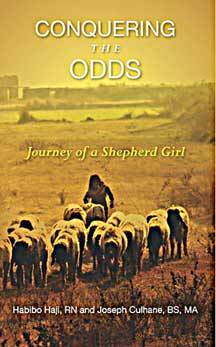 I also review her book, Conquering the Odds: Journey of a Shepherd Girl, which is an illuminating view into the struggles faced by African refugees. In addition to Habibo's story, our lead facilitator, Glen Fahs, provides an article on Coaching for Resiliency, which give those with a desire to help others some guidelines on being an effective resiliency coach. If you have any further desire to develop your own resiliency skills and strategies — to master change, thrive under pressure and bounce back from setbacks — we have many opportunities available to you. The ASRC offers several training programs that can be tailored to you or to your organization. We look forward to helping you resile! that in itself is a choice. " "What about you? When have you consciously chosen NOT to be a victim?" Continuing with our theme of choosing not to be a victim, David Pendlum is another bright example. Dave was born with a cleft palate and cleft lip and received little medical care until his mid-teens. As a result, he spent many years adopting a victim complex. At the age of 30, he finally listened to a friend who convinced him he was living in the past. He took the conversation as a wake-up call and began to develop a process to face his wounds, heal them and take control of his life. In this book, he presents techniques for taking personal responsibility, overcoming self-sabotage and reclaiming the balance necessary to lead a happier, healthier life. Read a brief version of David's story in his own words in his article "Overcoming Victimitis." Our own Certified Resiliency Trainer Michelle Atlas also helps coach women entrepreneurs with overcoming their obstacles to creating soul-fulfilling wealth. Join with Michelle as she hosts a FREE web-based interview series, "The Real Money Story" that taps into the experience of over a dozen successful women and shares ther individual journeys.